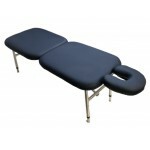 About this Model: The Mini Me 71cm is the lightest weight massage table for it's size . It is extra wide 71cm yet still as light as 7.8kg!. It is suitable for almost any modality due to its width and absolute super comfortable for the client. Perfect for Lomi Lomi, Kahuna, Hawaiian massage styles. Strength: Tested to carry 1000kg Static weight. working maximum load is 300kg. Amazingly easy to lug around and takes up little space in your car or storage. 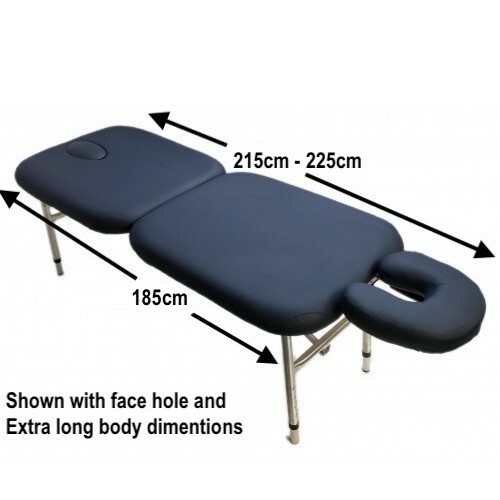 The Mini-Me is a great light-weight table for the mobile practitioner who prefers using the Face-Cradle (headrest) Arm-Rest system. The Mini-Me is as strong (can hold 1000kg) as any other portable table we make and more rigid in the centre than our other tables due to the shorter body. The Mini-Me table has a shorter body than regular massage tables. 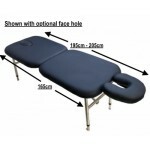 The extended head-rest is included and folds away easily with the accessories inside while transporting. The Mini-Me is made in the same way as our A.I.O table with a shorter body and without a face hole. It has a simple, strong and streamlined aluminium structure which is covered with our unique Side-Padding upholstery system. The Mini-Me can be extended in length from 195cm to 205cm and a foot extension accessory can also be added. 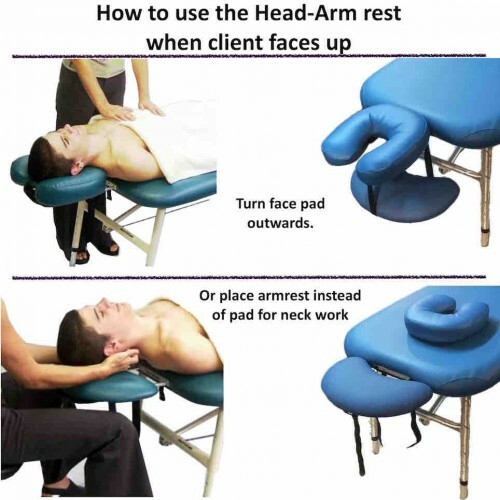 When your client turn in prone position.Turn over face pad 180 degrees – it becomes as a soft cushion and cradle clients headnicely. 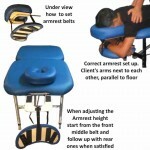 Great cushion when treating client’s body however restrict access to client’s neck. When you are about to treat client’s neck Strip arm rest and place instead of face pad. Great flat surface for neck work. As well space for practitioners legs underneath arm rest. 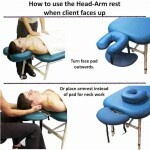 Finally you can place the face pad on top of arm rest - another option for extra cushioning hight if needed. The side padding system is another unique feature that only Meridian tables provide. It allows Meridian tables to be suited to any modality and at the same time provides the utmost comfort for both the practitioner and the client. Choosing the right width for your table can be a confusing decision. The Unique system of “side padding” – provides the solution to that dilemma. Normally there is a conflict between practitioner & client needs over the width of the table. In general, practitioners prefer narrow tables for better access, while clients prefer wide surfaces for comfort and arm space. 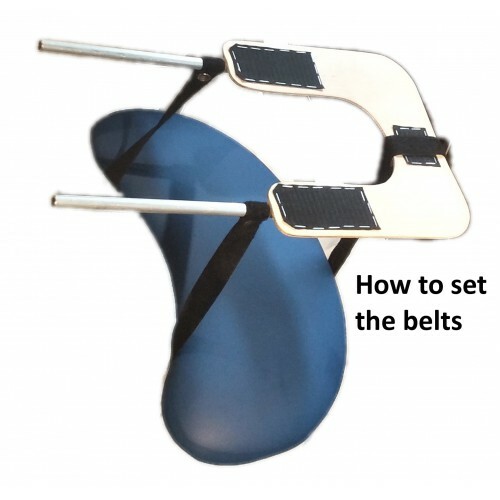 The side padding system lets the practitioner get close access & maintain correct posture while leaning against the spongy 7cm foam on each side of the table. For example: in our most popular “Mini-Me” variation (“MM69M”) – the total width including the side padding is 69cm and the structural width is 55cm. What that means is that as far as the client is concerned the table is 69cm wide, yet as far as the practitioner is concerned the table’s width is only 55cm wide. The Mini-me is available in two forms. If you are consider getting our Mini-Me table, you can choose either a plywood or Mesh base (approx 2kg lighter). Please note that the mesh base has more flexibility then the ply wood base. 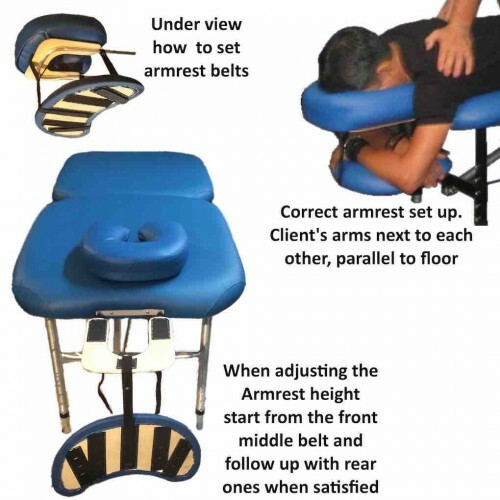 In the past we did not recommend the mesh base for deep work and we still feel that for manipulation style modalities such as chiropractic – plywood is the best. Yet recently it has come to our attention through one of our customers who treats many patients with chronic injuries that the mesh base actually assists the process. 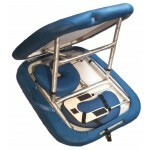 The feedback was that the mesh base felt more comfortable and allowed muscular relaxation under deep pressure. This is especially so in cases where injury and chronic muscular spasm is apparent. We then did some experimentation and were able to pinpoint why. With the mesh base we found it is best if slow, constant pressure is applied and synchronised with the client’s breath. When we applied the same technique and pressure using the ply base table, there was a “flat” feeling and overall tightening of the the client’s muscles around the ribcage. We found that the mesh flexibility allowed free movement and expansion of the rib cage even under deep pressure. The patient was able to freely breathe and relax into the deep pressure. Due to these findings, we are now re-assessing the type of foam that is suitable for different modalities. Please feel free to contact us for further enquiries and information. The Armrest is extremely comfortable and Multifunctional - you don't need to carry extra ..
Head Rest Structure onlyLightweight and strongFits into all our portable models.. The Castor Wheels Removable Legs is a great attachment option. Perfect practical solution those of y.. The Vinyl is attached with elastic - no staples. Like our Mini-Me mesh models the Easy removable Vi.. The Multi-Mount is an extra strong construction we attach to one end of your table that allows the “..
Flexi Wings is Our newest invention – arm support attachment that easily move with clients arms to a..